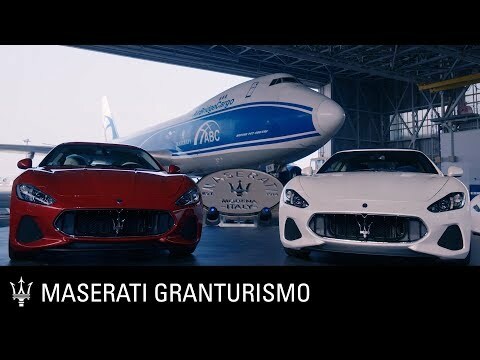 The GranCabrio is the first convertible car Maserati has ever produced which comfortably fits four people; a major development in the history of the Maserati brand. This GranCabrio oozes passion and modernity while the convertible element offers a sense of freedom and thrilling excitement. Inspired by the GranTurismo the GranCabrio effortlessly combines pulse-quickening performance with a flawless and elegant design. The GranCabrio's soft top is the cars most distinctive exterior feature. Flawlessly designed using the highest quality material and technological equipment, it creates a sophisticated and stylish finish which perfectly demonstrated Maserati's classic traditional style. Due to the carefully selected materials and innovative operating system the cars weight has not been affected despite the large and spacious interior which needs covered. When the soft top is up it cuts a forward-slopping shape which gives the car the shape of an impressive coupé. The rear sports an impressive triangular light display comprising of 96 LED lights along with a large aerodynamic diffuser which enforces the vibrant character of the car. 20" rims display the famous Maserati logo, also adding to the GranCabrio's dynamic spirit. When the impressive soft top is down, this coupe shape is transformed into a spectacular convertible. The figure screams feline power and charm with elegant lines projecting down to the long engine hood displaying the familiar Maserati “V" shape which stretches down to meet the noticeable radiator grille. The stunning shape is thanks to in-depth aerodynamic exploration and is found to limit turbulence which convertibles are typically known for. A standard Chrome Line version is available decorating a number of the body's features with chrome-plating, adding extra radiance to the exterior. The interior of the GranCabrio makes drivers and passengers feel privileged to ride in this fine car. Inside the car the unique spirit portrayed by the exterior continues, displaying an elegant mix of fine craftsmanship, exquisite style and the greatest levels of comfort. Offering spacious comfort for up to four adults, the cabin is much larger than the category average giving customers so much more from this luxurious convertible. A central tunnel divides the cabin distributing the available space evenly among seats. The decorative “V" style of the dashboard is a central focal point of the interior, displaying many of the cars controls as well as a 7" Maserati Multimedia Screen. Many key multimedia functions can be controlled by the dynamic steering wheel, improving convenience and safety. The interior is not only good to look at, but to touch thanks to the exquisite handmade Poltrona Frau leather upholstery as well as an extravagant choice of fine wood included in the decorative features of the dashboard and rear side panels of the door. This attention to detail resonates through the entire design of the GranCabrio's interior from the chrome-plated aspects of the dashboard and steering wheel to the prominent Maserati Trident logo hand-embossed on the headrests of the seats. Precise and elegant stitching also appears on the front and rear armrests while Alcantara finishing covers the rear of the gear shift paddles. This immaculate attention to detail is what creates the exquisite and lavish atmosphere found in a Maserati car. Maximum environmental comfort is achieved thanks to the climate control system which recognises when the cars top is up or down and can automatically alter the air output, maintaining the temperature settings. Three layers of excellent soundproofing in the canvas roof also add to the on-board levels of comfort. The GranCabrio runs off an impressive 90 degree V8 engine which uses the same technologies as all of Maserati's famed engines, giving a performance that is power specific with low running noise and a smooth response. A six-speed ZF automatic gearbox with hydraulic torque means gearshifts are smooth and do not hinder the sporty power and speed of the V8 engine. Thanks to the well balanced weight distribution of the GranCabrio, achieved by moving the engine behind the front axle, the car is easier to drive, increasing stability along with reliable and precise handling. Aluminium gas dampers along with the Skyhook electronic system senses the driver's style and road conditions to seamlessly adapt the cars set up, providing the greatest possible comfort on the road. An optional Sport mode can be selected, delivering a sportier driving style with a more rigid suspension setting. Safety is in no way compromised by style and is a high priority in the GranCabrio. The Maserati Stability Program electronic stability control system monitors the cars excellent handling and prevents the car from side-skidding by reducing engine torque as well as avoiding wheel locking during breaking and wheel spins during acceleration. Every customer can be sure that their Maserati GranCabrio is designed to their own personal tastes thanks to Maserati's impressive personalisation program. Customers can choose from a number of interior leather colour combinations, wood finishes, soft top colours, exterior chrome plating, carpet rims and brake calipers to ensure the highest level of exclusiveness for each Maserati GranCabrio owner. Choose from three models: GranCabrio, GranCabrio Sport and GranCabrio MC.